In this first entry of the blog, we´ll speak of a relatively new set of soldiers. 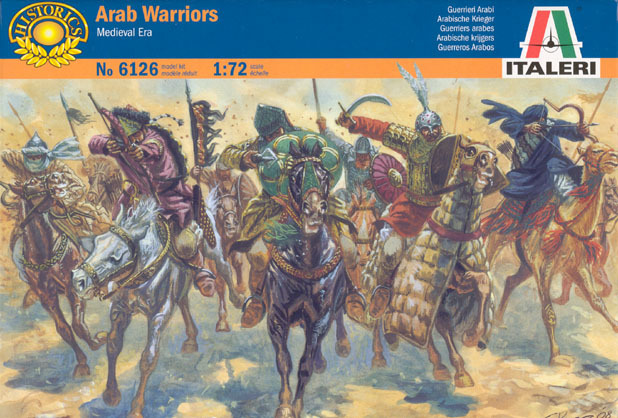 It is the Italeri Arab Warriors, which really seems a set to correctly represent the artwork of the Italeri Saracen Warriors (originally made by Esci). A nice box which I think compells you to buy the set, which is basically it's objective. If you are the type of Diogenes syndrom guy like me that collects boxes, it is a fine example. For once, the artwork depicts what you get. But I miss the three cavalrymen in the background, which would have been great additions and we don't get them, specially the flagbearer, but this can be solved with a bit of modification. We see here a very nice level of detail. Everything is crisp and this helps a lot with the painting. The only flaw is that in some points, detail is not present for moulding reasons, making the man with lance to have a big blob behind his shield, and the horse riding archer doesn´t really have a face. These will be really a 8.8, but they have the typical Italeri problem (and a problem that is spreading to all the manufacturers in our days); if they claim to be 1/72, they are rather tall and big. A dismounted man is as tall as a Esci mounted soldier, that is much more accurate in height. This is clearly made to make more easy the painting, moulding,and to see better the details... but it is nonetheless wrong, and if you want to place this cavalry along with men of Esci or other makes, they seem a bit weird. On the good side, there absolutely no flash at all, and as is usual with Italeri, their quality controls makes it nearly impossible to find a set with flash or moulding defects. 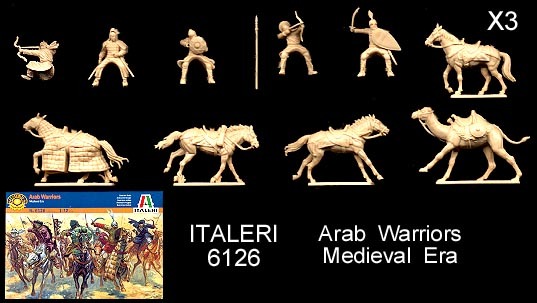 This set is labeled as "Arab Warriors", not even cavalry, to fit the highest possible range. 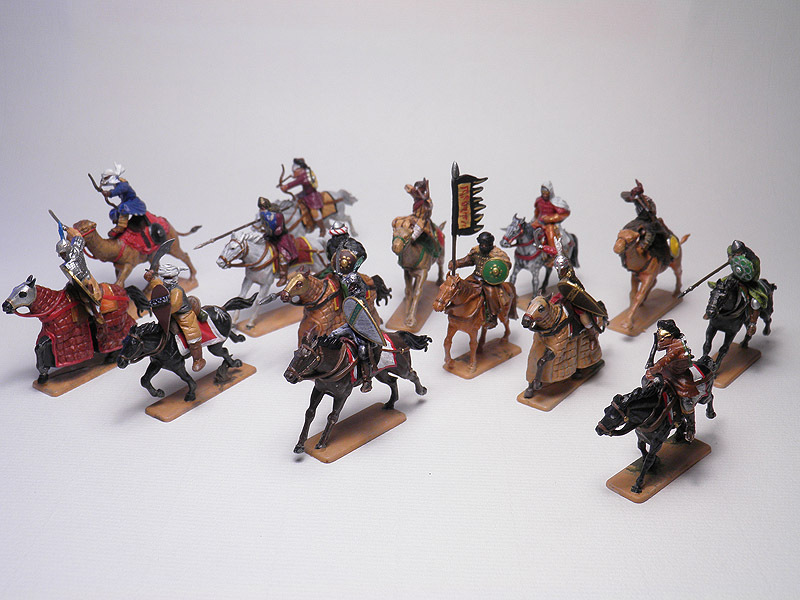 But the inclusion of the second figure in the row, which clearly wants to depict Saladin, establishes that these figures have to be Fatimid Cavalry of the period 1163 ad to 1193 ad. Some figures seem to wear a rather elaborate kind of clothes and armour, and they seem to represent warriors of a later period. The horse riding archer, which represents a Turkic mercenary, has a quite weird helmet, which is probably a adaptation of the sculptor which really is very sloppy. You can compare with the artwork to see how wrong it is. As with nearly all sets, the given lance is a bit too short. I can´t say they were not used, but the most probable thing is that you wouldn´t use a charging lance that barely sticks past your horse. These soldiers have a good level of "Army representation", that is, how many kingdoms and armies you can represent using them. 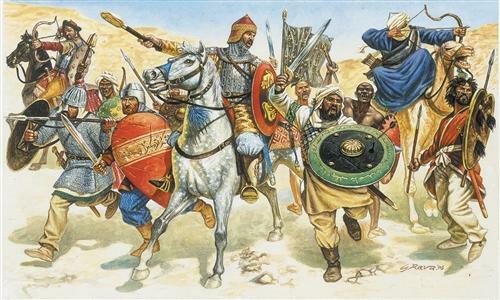 If we forgot the "Saladin" figures, this could represent many Arab armies from the 1100 to the 1400, like the Abbasid Caliphate, the Kwarizmian Empire (if we discard the camel rider), Ayyubid Sultanate, the Mamluk sultanate and the various arab kingdoms there were in Tunisia. The exception to this is the camel rider, which could be used from the rise of Islam to the colonial wars with the Mahdi in Sudan!. Yes, I feel that many reviews are oblivious to this point - there are fantastic figures, which you can´t say anything against, but they are just too "correct", maybe too static, and so just boring. So I feel that this is an important statistic on deciding if you buy this set. They are nicely done with active and combative poses, something that is greatly appreciated. But we find one big problem; we are clearly given 3 Saladins, which makes you have to discard two of the figures, and the Saladin we get, is one that is a bit dull. The best one is clearly the camel rider, as it is a very under-represented aspect of the Arab armies. They could have a higher score if they gave you some more poses. 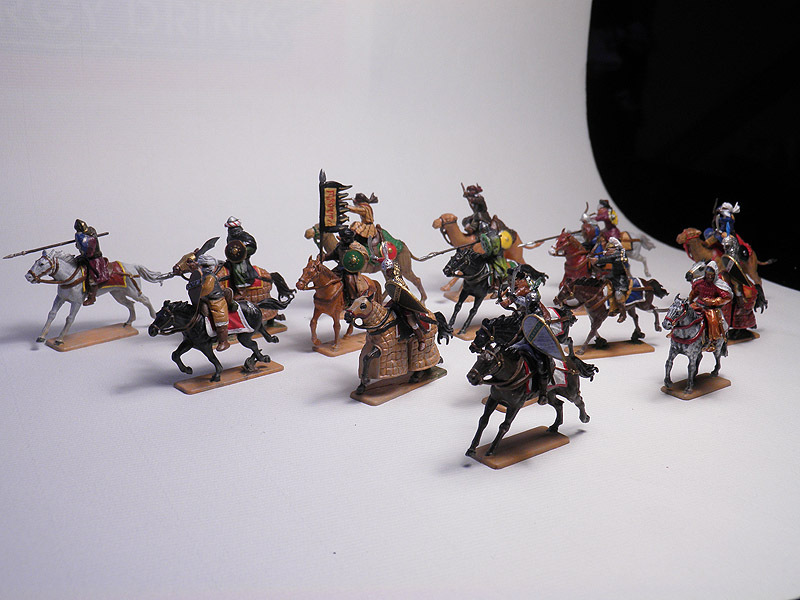 Both mounted archers in the first picture are exactly reproduced in this set. Clearly a lot of people complained (like myself!) that we were shown something we didn´t get at all, and you can only thank Italeri for making them. In the second pic we can see two non produced,as yet, figures, but at least we´ve got the horse, which has been also perfectly reproduced in this set. We can only wait until we will get some of the other infantrymen! We lack a bit some poses here, like a flagbearer, a musician, etc. 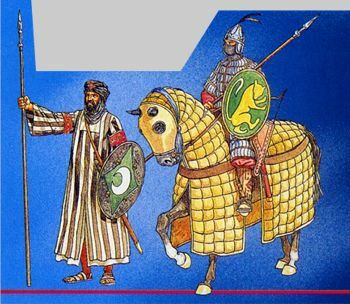 We are really given very distinct types of troops - a Turkic mercenary, a camel rider, a lancer and a swordsmen who look like heavy cavalry or the Sultan´s guard, and finally 3 leaders which can only be Saladin. 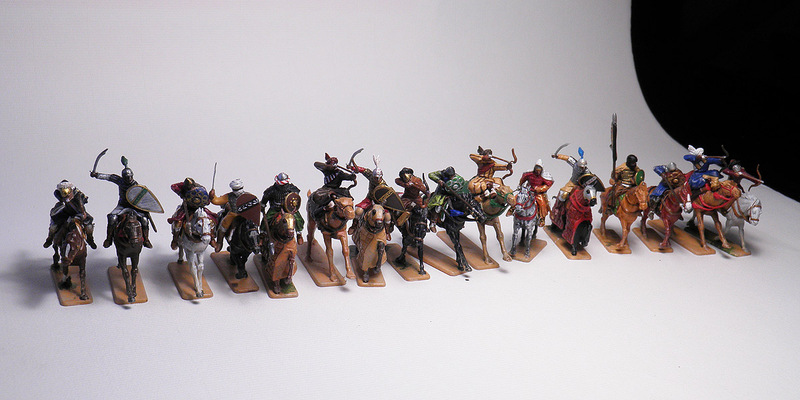 There are too few poses to make a good overall Arab Cavalry, and they are too distinct to represent a single body, so you´ll have to complement them (not too easy with their height!) with others or make some modification to them to get them up to high wargaming level. The price value ratio of this soldiers will vary between every shop you go to, and the best I can do is judge by their average price on eBay. This appears to be between 8 GBP-10 €-12 $, which seems somewhat high. You are given 15 figures, but you nearly have to discard two of them. In my case I bought my set at a retail store at a quite good price (8 €), which makes them better. 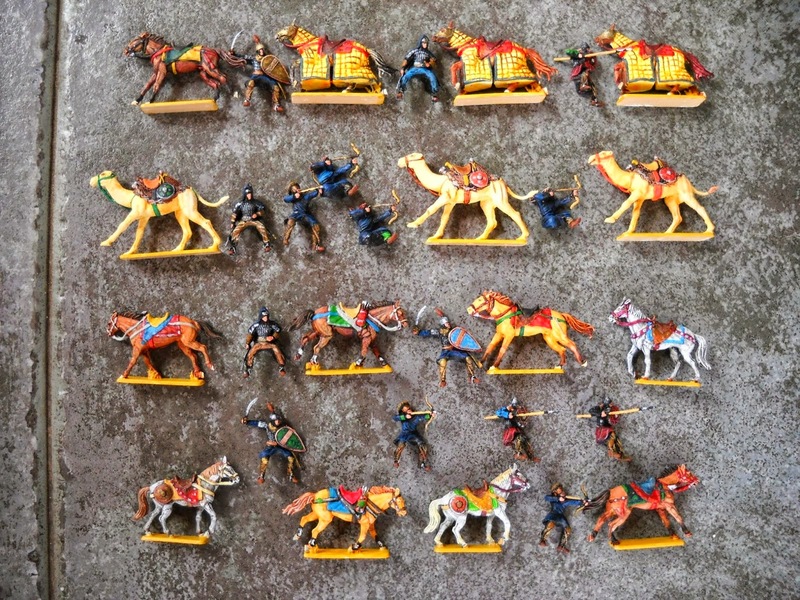 Even if they have some flaws, these are the best Arab Cavalry that there are out there, and knowing that nearly all the manufacturers have already made one (we are only waiting for what Zvezda could do, which probably will be better, giving you more poses, a unique leader, and more men, but it doesn't seem it is on their line of future releases, at least at the moment), I strongly advise you to buy this set. These have been painted by myself. Note that the 4th figure is a home made soldier, the 5th is a conversion using a "Saladin", and the flag bearer is another conversion of a Saladin figure (in the last pic).